Are you tired of the same old thing? So many times, we use the same activities for the same stories year in and year out. Don't limit your choices of Sunday school materials. Wouldn't you rather light the spark in your kids' eyes while teaching them the wonderful lessons from the Bible? You CAN! 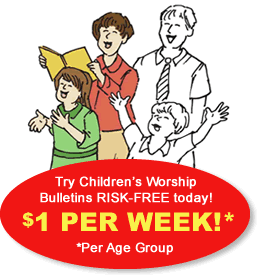 Children's Worship Bulletins offers a great variety with selections of content from the Old Testament, Gospels and the Epistles. Each bulletin has four panels packed with Bible-based games, puzzles, word searches and many more activities children will love. To show you how easy it is to plan activities with Children's Worship Bulletins, we've included two Sunday school activities about Jonah in this short article for you to use this week! You'll see how easy it is to create engaging and meaningful activities for your Sunday school class. Give each child a bulletin and a pencil. Instruct the children to complete the matching puzzle, "When a storm threatened his ship ... " while reading the story from Jonah 1:1-17, 2:1-10. After the children have matched the pictures, engage them in a conversation about which picture shows what happened first, what happened next and what happened last. Ask for a volunteer to retell the story, using the pictures as a guide. Allow as many storytellers as volunteers. Give each child a bulletin, a pencil, a pair of scissors and some crayons or colored pencils. Instruct the children to complete the puzzle, "But Jonah ran away from the Lord ... "
Then, have the children color and cut out the five pictures of the story. Explain the activity, "After coloring and cutting out the five pictures of the story of Jonah, find a partner. 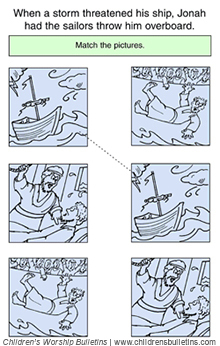 Without looking at the bulletin, use the pictures to tell your partner the story of Jonah. Try to remember as many details as you can about the story. After you're done, read the story in your bulletin again while looking at the pictures. Then, switch. The person who told the story first will listen as his or her partner tells the story by using the pictures. After he or she is done, read the story in your bulletin again while looking at the pictures. Practice telling the story to each other until you remember all of the details about the story by just looking at the pictures." After the children have had time to work on remembering the story by using the pictures, ask for a volunteer to tell the story to the class.